That was also what all who knew her thought about her. Jessica passed away in a car accident January 23, 2010. Born December 18, 1992 to Chet & Shirley Haney, she moved to Molalla as an infant. Jessica was a student at Maple Grove Elementary then Molalla River Middle School. As a high school student at Molalla High School, she was a good student with plans to be a pediatric oncology nurse. She was active in FFA and a member of the Equestrian Team. She loved her friends more than anything. Jessica was passionate about anything to do with horses. She loved her horse Hagen. She was very involved in the 4-H horse program both as a member and role model for her club members. She served as a camp counselor in the summers, and mentor to numerous kids. Jessica approached life with such an amazing vigor. Everyone who met her loved her and always remembers the wonderful smile and positive attitude. With Jessica, one always knew where you stood, she never let things ride- if you upset her she told you right then. It was dealt with and the world was right again. Jessica was lucky enough to experience real love before she left us. Tyler Benthin and Jessica had plans for a long future together. Jessica is survived by parents Chet & Shirley Haney, Molalla, OR, sister Tazshma Haney, sister Amara Haney, brother Jacob Haney. Grandparents Bert & Bobbi Bixby of Oregon City, OR, Delbert & Michelle Haney of Salem, OR, and Nancy & Mike Emery of Molalla, OR. Dearest friends Stephanie Cox & Tyler Benthin. Numerous Aunts, Uncles, Cousins, and many many friends both from school & the horse world. She also left behind her beloved horse Hagen. Memorial arrangements are pending at this time. Jessica you were an amazing young lady and would have been an incredible adult. You will be missed by all who knew you. Published in on-line Molalla (Oregon) Pioneer on January 25, 2011. A single-vehicle accident on Highway 211 took the life of a Molalla High School senior on Sunday afternoon. Jessica Amber Haney, 18, a lifelong Molalla resident, was coming home from visiting her boyfriend in Clarkes on Jan. 23 when she crashed heading southbound on Highway 211 near S. Wright Road, east of Molalla. For an unknown reason, her 1996 Ford F-350 flatbed pickup appears to have traveled across the northbound lane and off the highway, striking a power pole and coming to rest next to a driveway around 4:45 p.m., according to a press release from Oregon State Police. Molalla Fire District responded to the scene and called for a Life Flight helicopter. “She was pinned in the car, so we cut the top off,” said Lt. Denise Everhart, spokeswoman for MFD. Once paramedics were able to reach Jessica, they discovered she could not be saved and canceled Life Flight, Everhart said. Jessica was pronounced dead at the scene. She was wearing a seatbelt, according to OSP. A portion of the highway was closed for the rest of the evening while OSP troopers investigated the fatality. Clackamas County Sheriff's Office, Molalla Police Department and the Clackamas County Medical Examiner also assisted on the scene. Haney is the daughter of Shirley and Chet Haney of Molalla. She has two older sisters, Amara and Tazshma, and a younger brother, Jacob. 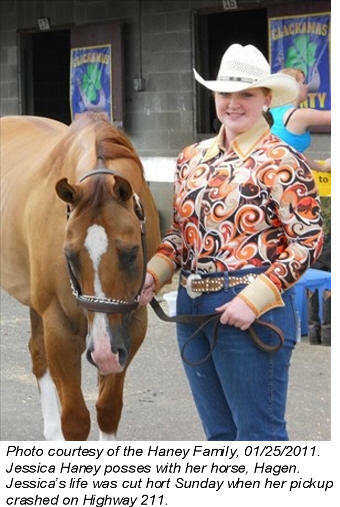 Her mother, Shirley Haney, said Jessica was active with the MHS equestrian team and Molalla FFA and had been a member of 4-H for nine years. Mackenzie Behrle, one of the FFA teachers at MHS, said Jessica had been involved with FFA since her freshman year and raised pigs and a horse. “There are a lot of sad people surrounding me in this room right now,” Behrle said from her classroom telephone on Monday. MHS Principal Randy Dalton said the school’s crisis management team, including school administrators and counselors, prepared a statement for teachers to read during their first class period on Monday regarding Jessica’s death. The middle school sent a counselor to assist at MHS and the district’s psychologist was also on site Monday. Jessica’s family has requested that in lieu of flowers, memorial donations can be made toward a 4-H scholarship fund in Jessica’s name. Donations may be sent to: Jessica Haney, c/o Clackamas County 4-H Leaders Association, 200 Warner Milne Road, Oregon City, OR 97045. Read the obituary, above, submitted by Jessica’s family.